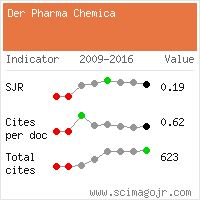 Der Pharma Chemica publishes research articles, communications, review papers and book reviews. The Editors of Der Pharma Chemica, each responsible for different area of Chemistry, seek advice from experts of in the appropriate field. Research articles and communications are reviewed by a minimum of two reviewers, review papers by at least three. please note that this will be treated only as a suggestion, and the final selection of reviewers is exclusively the Editor’s decision. The Editors are fully responsible for decisions about manuscripts. The final decision whether to accept or reject a paper rests with them. The Managing Editor only communicates the final decision, and informs the authors about further processing. When revision of a manuscript is requested, authors should return the revised version of their manuscript as soon as possible. Prompt action may ensure fast publication if a paper is finally accepted for publication in Der Pharma Chemica. If it is the first revision of an article authors need to return their revised manuscript within 15 days. If it is the second revision authors need to return their revised manuscript within 7 days. If these deadlines are not met, and no specific arrangements for completion have been made with the Editor, the manuscript will be treated as a new one and will receive a new identification code along with a new registration date. Authors will receive a pdf file with the edited version of their manuscript for final proofreading. This is the last opportunity to view an article before its publication on the journal web site. No changes or modifications can be introduced once it is published. Thus authors are requested to check their proof pages carefully against manuscript within 3 working days and prepare a separate document containing all changes that should be introduced. Authors are sometimes asked to provide additional comments and explanations in response to remarks and queries from the language or technical editors. Manuscripts accepted for publication are published on-line in so called Online First service as soon as they are ready for publication (that is when final proofreading is performed by authors, and all concerns are resolved). Once a manuscript appears on the Web site it is considered as published. After publication, the corresponding author is notified by email, and receives a pdf file with the published version of the manuscript. If any errors are detected in the published material they should be reported to the Managing Editor. The corresponding authors should send appropriate corrected material to the Managing Editor via email. 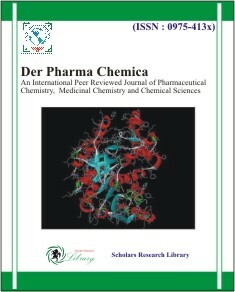 This material will be considered for publication in the earliest available issue of Der Pharma Chemica.